Rivers have always been important to local communities, whether for food, as with the Neolithic hunter-gatherers using flint barbed spears, or for commerce, as with corn and paper mills. Chalk rivers, in particular, have been designated a priority biodiversity habitat in the UK, where there are more such rivers than anywhere else in the world. The River Gade, and its tributary the Bulbourne, are both chalk streams. They rise from the underlying chalk aquifer (reservoir) below the eastern escarpment of the Chiltern Hills. More recently, the demands of society have increased beyond the capabilities of the local aquifer. This has had a direct impact on the rivers’ health, including the invertebrates, flora and fauna they support. Water is such a vital resource it needs care and commitment to be sustainable. Frogmore Mill has a long history. 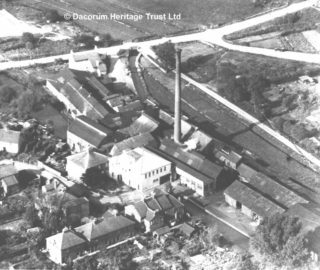 Once called Covent Mill, it may have been one of the four Hemel Hempstead mills noted in the Domesday Book. In the 13th century there was a watermill used for fulling cloth near the River Gade. It was leased by the Fourdriniers in 1803 in order to trial the world’s first papermaking machine. An improved, commercially viable, machine followed in 1804. They had already taken over the nearby Two Waters Mill for papermaking. Frogmore was purchased by the Grand Junction Canal Company in 1817. A connection was made that year to the adjacent canal. The canal company may have wished to avoid disputes with future mill owners. There were frequent disagreements, since the water was pumped from the aquifer to the detriment of the rivers on which the mills depended for power at that time. The larger mills eventually relied on their own boreholes for water. The building of canals partly solved the problem caused by the poor state of the roads in the 18th century. It was almost impossible to carry heavy, bulky goods such as coal and road transport then was slow, unreliable and expensive. The Grand Junction Canal, later renamed the Grand Union, followed the course of the rivers Gade and Bulbourne. It reached Berkhamsted on its way from London to the Midlands by 1798. The diversion of this canal at Apsley in 1818 gave John Dickinson direct access to an expanding national canal network. All his company’s mills were soon connected by inland waterways to the depot at Paddington. Deliveries were easily made from there to the London area. Coal arrived in barges from the Midlands to power the steam-driven papermaking machines. 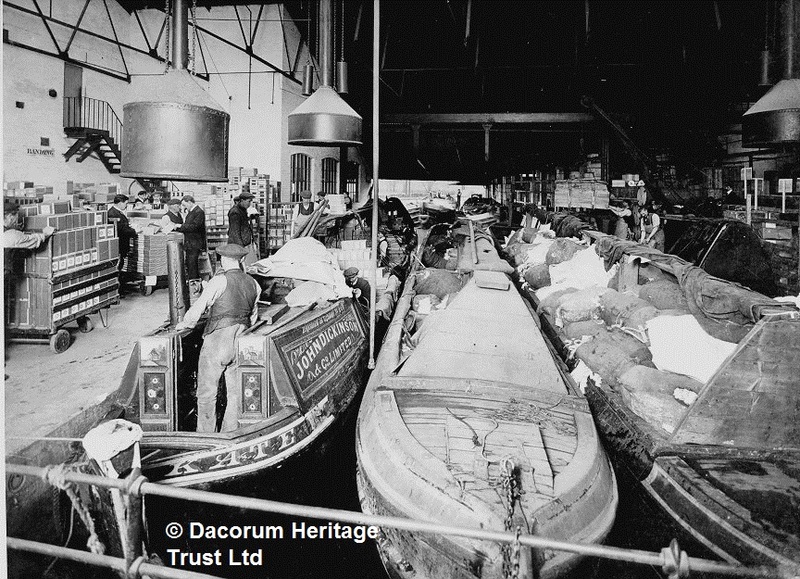 The boats brought raw materials to the mills and took finished goods back to London. This page was added on 11/08/2011. One of my ancestors (Sells) was one of the people who used to take paper from Dickinsons to London on a barge. I have yet to find out their full names though. If anyone can provide this information it would be most helpful or maybe let me know where I can get find this out.